Summary : The pizza here isn't great, but it's better than what you might expect in Canton. The pies are fresh and locals swear by it. Any man who loves to travel will at some point — some time in his life — find himself in a small town in the middle of nowhere with very few reliable food options. Typically these types of situations occur in foreign countries. 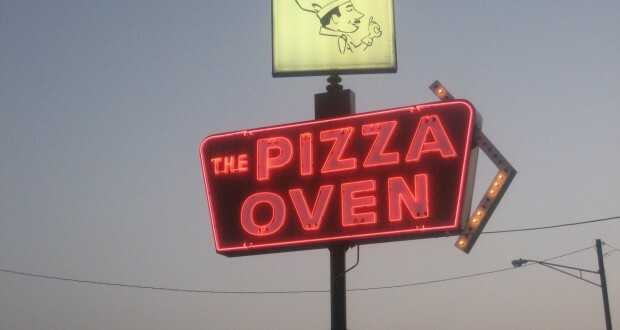 But truth be told… there aren’t many solid dining options in Canton, Ohio… which led me and my friends to the town’s most popular pizza chain: Pizza Oven. In case you haven’t been following, I recently went on a road trip from Washington, DC to Chicago. My first pizza stop was at Spike Mendelsohn’s new place — We, The Pizza — in DC. After leaving DC, our next stop was Canton, which is about seven hours away. The only notable site there is to see in Canton is the Professional Football Hall Of Fame. As we left the museum and it began to get dark, we needed to make a quick decision about what to eat. After consulting our Yelp applications and some sheets we’d printed out prior to leaving, we decided that there were no worthwhile dining options in Canton. We narrowed it down to fast food and pizza. Of course, my vote went to pizza. There appeared to be a number of local pizza establishments that we could choose from (like Italo’s), but we settled on a take-out only spot: Pizza Oven. With eight locations in the Canton area, I figured they had to be doing something right. The Pizza Oven location that we went to — at 3153 W Tuscarawas Street — looked like the place three unwitting twenty somethings might go to right before they were brutally murdered in a horror film. The place was literally a shack on the side of the road, and as we approached the front door we noticed a sign that read: WE WILL BUZZ YOU IN AFTER DARK. Upon entering we learned that not only do they specialize in pizza, but also chicken wings. According to a patron who was waiting for his food — it doesn’t get much better than this. He swears by both the pizza and chicken at Pizza Oven. I didn’t bother to ask if he’d ever been to New York City… or had ever left the state of Ohio!On a promising note, all pies are made fresh to order meaning that we had to wait about 20 minutes for our pie. I always prefer a fresh pie over one that’s been sitting out, so I didn’t mind the wait… although as time ticked by… it got darker outside… and more frightening inside. The two guys behind the counter were chatty and intrigued about how the three of us ended up in their shop from New York City. The menu itself was pretty bare bones — there were 14 toppings available and all pies come in sizes individual, small or large. An individual cheese pie was just 4.40 and a large cheese pie — which we ordered — came to $11.55. Even for Canton, that seemed pretty reasonable. The most expensive pie on the menu was the large deluxe which contains five toppings and costs $18.75.Other than a floor to ceiling stack of pizza boxes and a fridge with sodas and beer, there wasn’t much else in the space itself. Most people had called in their orders ahead of time, and while we were waiting, 3-4 people stopped in to pick up their food. We brought our pie back to our hotel, and considering that we were nearly starving, it was quite satisfactory. It probably tasted worse than your average New York slice joint, but at the same time… there wasn’t anything else I would have rather been eating. It’s defining characteristic was the slices of mozzarella cheese (not to be confused with balls of fresh mozzarella) that were melted on top of the pie. The cheese most definitely overwhelmed the sauce. With every bite I took, I could more clearly envision locals suffering from what I’ve referred to many times before as a “hometown bias” when talking about Pizza Oven. That is, the unconscious tendency to overrate a beloved childhood and/or hometown pizza place. Truth be told, it did the trick on this particular evening. And if anyone ever asks me for a good food recommendation in Canton, I won’t hesitate to send them to Pizza Oven. Just beware — I’d caution — they better place their order before nightfall.